How many cats were registered in CFA, TICA and GCCF in the past few years? There are three sets of numbers that reveal the general health of a cat registry: The number of kitten registrations each year; the number of show and show entries each year; and of course, a financial report - the income earned each year by the registry and the expenses incurred. In the year 2000, PandEcats.com published an article titled Kitten Registration Statistics. In the article, we analyzed the number of kittens registered in CFA, TICA, and GCCF each year from 1994-1999. Just for fun, we also included the numbers of puppy registrations for AKC. The goal of the original article was to obtain a numerical overview of the state of the various cat registries with regards to size & growth and how these factors might be used to predict the future for each registry and the cat fancy in general. What has happened since 1999? CFA registrations have declined every year over the past decade. While all registries are affected by some common factors that might reduce registrations (an aging fancy, anti-breeder legislation etc. ), reasons for the decline in CFA registrations specifically may stem from registration policies regarding breed acceptance and limitations and WIAB (What Is A Breed). CFA does not recognize any breeds with wild blood. New breeds without wild blood working towards acceptance tend to work towards recognition for championship status in TICA first. Mandatory inspections of high volume breeders may also discourage existing breeders from increasing their breeding populations. In the past decade, TICA has almost doubled in size. 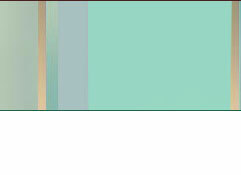 Participation in TICA continues to make it the fastest growing cat registry. TICA's liberal registration policies provide a place to register and show breeds which are not accepted in some registries. For example, the Longhaired Exotic which is registered in CFA but not eligible for championship status, is shown and registered in TICA as a Persian. TICA's policy of welcoming and supporting new breeds and their development is another significant factor in their continued growth. These registration policies will continue to encourage cat breeders to make TICA their registry of choice. The cat fancy in Great Britain would also appear to be doing just fine. With a long history as a cat registry, GCCF records high numbers of kitten registrations - a fact made more impressive when considering that the population of Great Britain is so much smaller than the countries in which the other registries dominate. If GCCF continues its gains it will become the largest single registry in the world with the next decade. It should be noted that FIFE, which acts as an umbrella registry for individual countries mainly in Europe, registered about 80,000 kittens in 2004. In general, the future of the cat registries seems divided into two camps. TICA and GCCF are smaller registries in total numbers however are showing healthy growth. 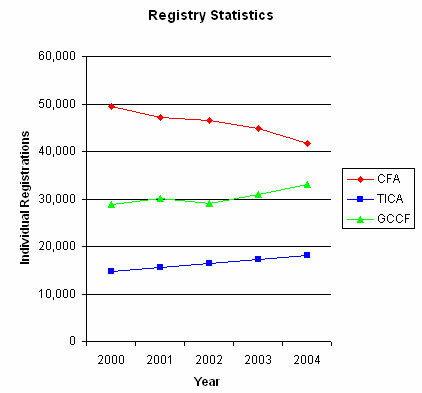 CFA, the largest single cat registry, has shown a consistent decline in registration over the past decade. If present trends hold, GCCF will become the dominant cat registry while the future of CFA seems less hopeful.